Google’s DNS aren’t enabled: we should access our router’s connectivity configuration and establish the latter to achieve a greater speed when it comes to connecting to any web. They are recommended by Mobdro. Your Android version is lower than what the app requires. 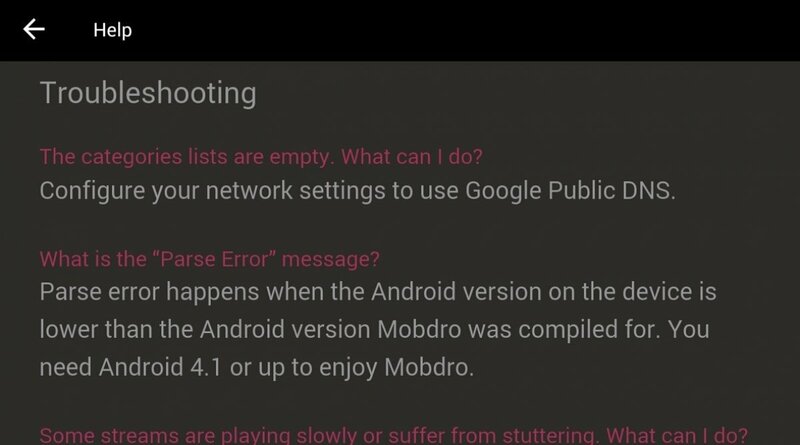 Mobdro requires Android 4.1 to be able to use the app but the truth is that if you’re not on a compatible version you wouldn’t even be able to install the app. Low connection speed: sometimes this error can be due to not being connected to a fast enough connection and we might be saturating our bandwidth, offering us a really slow connection that doesn’t even work. In this case, you should try to improve your connection (it might be simply due to the distance between the device and the emitter). Outdated app: it’s always recommendable to install the latest version of the app. In this case, you can check here at Malavida if there’s a new version to be downloaded or visit the official web page to see if there’s a new APK file. As we mentioned, this isn’t a very usual error but it can happen. The service itself might be down so the best thing you can do is follow Mobdro in its social networks to find out if there has been an incident or notification by its developers to know exactly what is going on.